Imagine climbing to a viewpoint and looking down on India’s holy river to watch hundreds of people wading into the muddy waters to wash away their sins. Now imagine bearing witness to an actual cremation ceremony taking place on the banks of the same river. These are just two of the deeply spiritual things to do in Varanasi, but it doesn’t stop there. 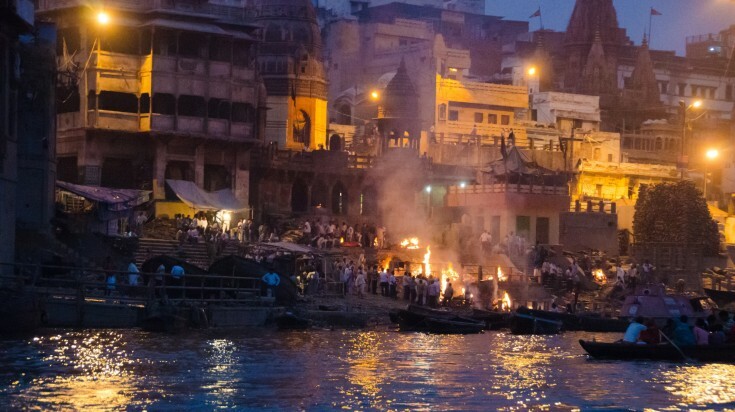 As one of the oldest cities in the world and the holiest city in India, Varanasi offers visitors an intense but magical glimpse into Hinduism and the local way of life. When it comes to what to do in Varanasi, this city is more about observing and absorbing the surroundings than hopping from place to place. By air: This is the quickest way is to fly into Lal Bahadur Shastri Airport in Varanasi from Delhi. There are daily direct flights starting at USD 30* with airlines like IndiGo, Vistara, Air India, and SpiceJet. The flight takes around 1 hour and 25 minutes. By train: Another easy and preferred method of travel to Varanasi from Delhi is by train. The fastest train will have you there in 11 – 12 hours, but some routes take as long as 18 hours. The speed of the train and number of stops along the way is what dictates the duration. The long travel hours are the reason why many travelers pick the night train option. You can leave Delhi in the afternoon and reach Varanasi by sunrise. The fastest trains (around 12 – 13 hours) are run by Swatantrta S Express, Shiv Ganga Express, New Delhi Guwahati Superfast Special, Poorva Express, and Rajdhani Express. The cost is anywhere between USD 6 – 18* depending on seat class. By bus: As with the trains, there are day and overnight bus options. The typical journey duration is around 13 – 14 hours. Uttar Pradesh State Road Transport Corporation, Safar Express Tour and Travel, R.S. Yadav Travels, Amar Travels, and Kn Nehra Travels are the most known companies. Prices range between USD 9 – 27* depending on bus company and seat class. Varanasi can also be easily accessed by flight from Mumbai, Goa, Bangalore, Kathmandu, and Khajuraho. The winter months of November – February are the best time to visit. 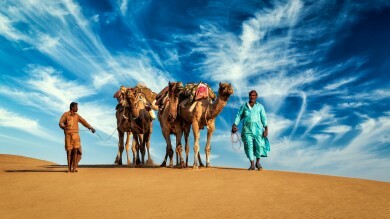 Temperatures can get quite cool as Varanasi is in northern India, however the weather during this time is more comfortable for touring, exploring, and walking around. Average daily temperatures are in the 15 – 21° C (mid-60 and 70° F). It’s common for evening temperatures to drop into the 7 – 13° C (40 and 50° F). Ghats are the large, flat steps built on the land that lead directly down into the Ganges River. They are used by pilgrims to enter the water to wash away their sins and pray and worship upon. The Manikarnika Ghat is a little bit different. It’s the main “burning ghat”, the most prosperous cremation site for a Hindu. On these steps, the body is dunked in the Ganges River prior to being burned by firewood on the steps. Tourists are allowed to witness the ceremony, but it’s crucial to be respectful. There are absolutely no photos allowed. You can watch the ceremonies from the top of nearby buildings. You will likely be invited to these spots by “guides” who will ask for donations for the ceremony in exchange for taking you there. Good to know: Varanasi is the most sacred place to die for Hindus because it’s believed that dying and being cremated here releases one from the cycle of reincarnation. Some make the journey to Varanasi just to die in the holy city. 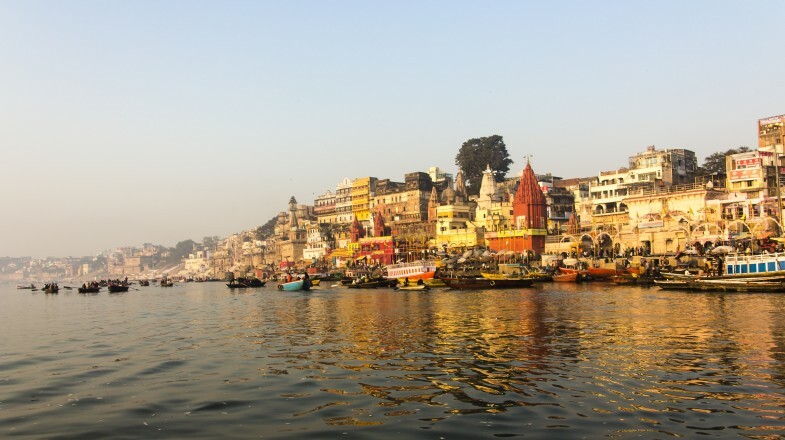 Flip your perspective of the famous ghats and book a boat ride down the Ganges River at either sunrise or sunset. Observing the people bathing and praying in the water as the sun’s light sets the backdrop of ghats and city buildings all aglow is a magical experience and definitely a top thing to do in Varanasi. It also offers a different viewpoint for photographers chasing after that perfect shot. Good to know: Traditional row boats are available all along the river side and the price can be negotiated. Expect to pay around USD 3 – 5* for a 90 to 120-minute boat ride. As the holiest city in India, you would be correct to assume that there are quite a few temples here. You can see temples literally at every turn, but the most spectacular is Kashi Vishwanath. Constructed in 1776 and dedicated to Lord Shiva, this temple holds nothing back. Aesthetically speaking, the temple is jaw-dropping; the dome and tower are coated in 800 kilograms of gold. It’s also one of the holiest (if not the holiest) Hindu temples in the world. Many saints have visited here and pilgrims attribute a visit to this temple and a bath in the Ganges as the path to liberation. Good to know: This temple is one of the twelve traditional Jyotirlinga temples in India, the most powerful and sacred place to worship Lord Shiva. This is a nightly event hosted by a group of young priests dressed in traditional clothing along the banks of the Ganges at the Dashashwamedh Ghat. 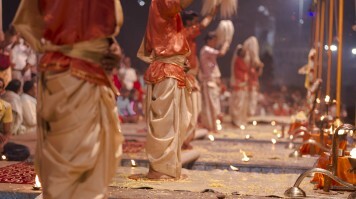 The ceremony is a show of commitment and dedication to Lord Shiva. Huge crowds gather around the ghat, lit by brass lamps, while mantras and chants fill the air at the start of the ceremony. Incenses are burned, conch shells are blown, and loud music is played while the priests perform their rituals. This a truly unique way to experience this holy city, making the Dashashwamedh Ghat an absolute top place to visit in Varanasi. 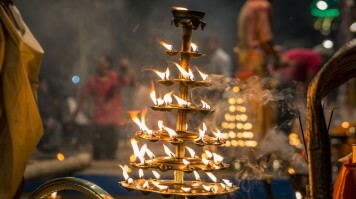 Good to know: The aarti takes place at 6:45pm every evening and lasts for about 45 minutes.Take an evening boat ride to Dashashwamedh Ghat to get the best views of the aarti ceremony. Get lost in the city as you soak up the true culture and witness daily life in its purest form. Put the Manikarnika Ghat behind you and wander where ever your heart desires. You’ll find street food, shops, guest houses, and restaurants all crammed into the ancient narrow alleyways. Be sure to check out the main shopping areas of Vishwanath Lane, Thateri Bazaar, and Godowilia Market, all which are within easy walking distances (20 minutes or less) from the famous ghat. These markets sell bags, ornate jewelry, shoes, clothing, silk sarees, bangles, fabrics, religions items, knickknacks, wooden carvings, copperware, and much more. Good to know: Varanasi is famous for its beautifully colored silk banarasi sarees. These can be worn wrapped around the waist like a skirt and wound around the bodice as a shoulder shawl. This is one authentic souvenir that should definitely be bought from the bazaars. 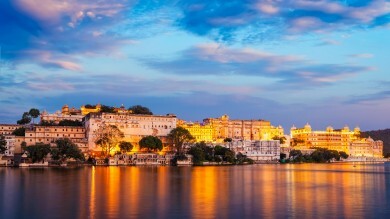 The most popular area to stay and the best central base for sightseeing and experiences are clustered near the Ganges River close to the ghats. Specifically, the closer you stay to the Dashashwamedh Ghat, the nearer to all the action you’ll be. If you want to be a little removed, but remain near the Ganges and ghats, consider moving 3 kilometers south to the area around Assi Ghat. It doesn’t get much cheaper than USD 2* a dorm bed, and you’ll be impressed with what you get for this meager amount. Set back roughly 1 kilometer from the Dashashwamedh Ghat, HOG is also under 3 kilometers from all of our top 5 favorite attractions. Each dorm bed is equipped with its own mini, wall-mounted fan, several electric plugs, and bedside lamp. The beds are comfortable and offer a bit of privacy with a sheer curtain that can be pulled when desired. Additionally, the hostel offers free breakfast, a coffee maker in every room, and free Wi-Fi. The clincher? The near-perfect reviews. This 3-star hotel is about halfway between Assi Ghat and Dashashwamedh Ghat, making it a good choice for those don’t prefer to be in the thick of things, but also don’t want a long commute to their top attractions. Free Wi-Fi, airport transfer, and A/C in all the rooms ensure guests stay comfortable. Recent renovations equate to spacious rooms and overall modern vibes. Amenities include an on-site restaurant and garden terrace. A double occupancy room starts at USD 87* per night. Not only is this 5-star abode conveniently located just 200 meters from Dashashwamedh Ghat, this hotel also happens to be perched atop its very own ghat with spectacularly sweeping views of the Ganges and all its glory. The hotel was built in the 18th century and boasts exquisite interior and old-world charm. The rooftop terrace dining area, with sprawling views of the Ganges, is definitely a highlight. The level of service is exceptional, and despite the centuries-old feel, every room is equipped with modern comforts. Double rooms start at USD 323* per night. Hawkers are extremely persistent in Varanasi. Make it clear from the beginning if you don’t want to take them up on their offers or comply with their donation requests. If you allow them to follow you around, they may become angry when you decide not to pay them. It’s common to see the locals smoking cannabis on the street as part of their religious rituals. 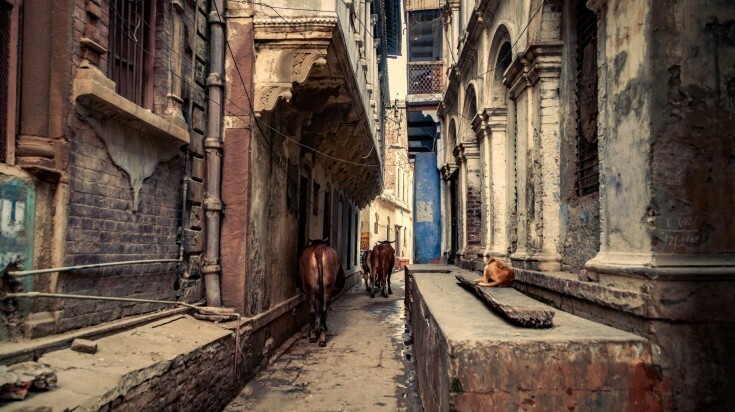 Cows are holy animals in India and there are literally thousands of them wandering the streets of Varanasi — be careful not to step in their waste, which is found in the streets. Keep a business card with your hostel/hotel address on you at all times. In case you get lost in the winding alleys, you will be able to ask someone how to get home later. You will see dead bodies wrapped in cloth being carried down the main street on Varanasi on the way to the Burning Ghat. This may seem shocking at first, but remember, this is a holy ritual. Don’t be shy when it comes to negotiating the price during bazaar shopping or for boat tours on the Ganges. Cover your shoulders and legs. This is as much for being respectful of the culture and religion as it is for cleanliness. It’s advised (even by the Indian Government) not to bath or get in the water of the Ganges River in Varanasi. It’s disease-ridden and polluted. Hire a guide to conduct a walking tour for a few hours. They can enlighten you on all the ceremonies, traditions, and activities you’re observing. 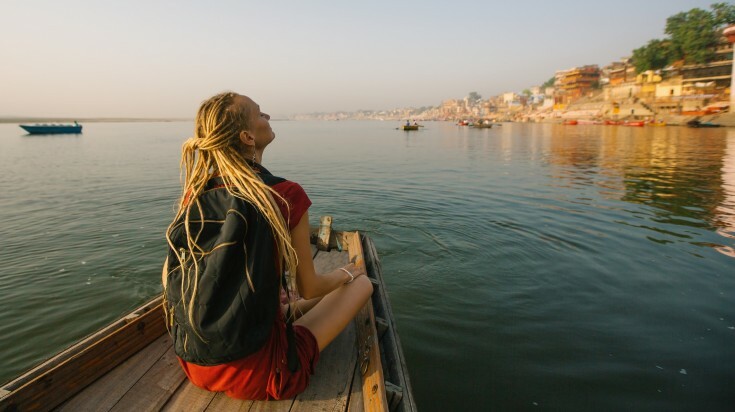 Despite Varanasi being the most significant holy city in India and being absolutely stunning on many levels, be prepared for an abundance of pollution, dirt, and dense crowds of people. Get up at sunrise and explore the city before it becomes jam-packed. This is a magical time for taking pictures. Varanasi is a city of contradictions. The culture and traditions in Varanasi are unapologetic and what you see here will likely stay with you for the rest of your life. The holy rituals, the ancient temples, the bazaar shopping, and the cremation ceremonies are experiences that cannot be had anywhere else in the world. When it comes to things to do in Varanasi, don’t plan or think too much; just keep an open mind as you wander around and let yourself fall under the spell of this truly enchanted city.